Walking along the Strand, the two Chinamen and lion sitting above the front entrance of the Twinings shop caught my eye. Ah, Twinings tea, the trusted tea brand that I and millions of tea connoisseurs around the world drink everyday. Refreshing and exotic tea blends like Earl Grey, Lapsang Souchong, Orange Pekoe, Assam, Russian Caravan and Prince of Wales quickly come to mind. Looking at the polished white frontage of the Twinings premises, I mistakenly assumed that this is one of the new trendy tea shops that have cropped up in London. 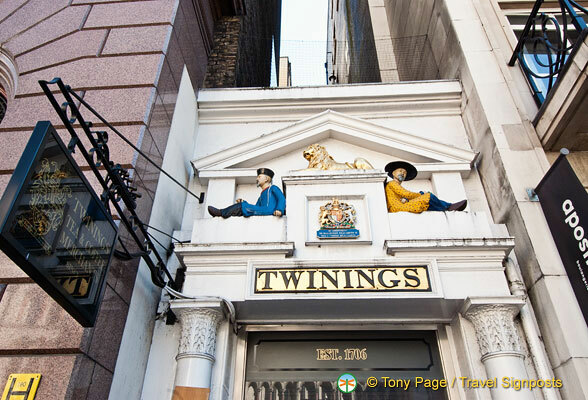 Tony reminds me that Twinings have occupied these premises at 216 Strand since 1706 when it was established. Twinings also holds the record for the world’s oldest company logo in use. When Thomas Twining bought Tom’s Coffee House in 1706, coffee, gin and ale were the most popular drinks in England at that time. The shop’s location was ideal as the area had become newly affluent with the upper class and aristocratic families moving here. Coffee houses were a popular feature of life in London but there was strong competition between the coffee houses. The differentiating factor at Tom’s was tea. As tea was a new import from China, many were initially suspicious of it. Thomas Twining won fans over by promising to sell only the finest qualities and varieties. Tea drinking became very fashionable during the 18th century, especially among the upper classes, in spite of attempts by the authorities to suppress tea consumption through high taxes. Over 300 years after Thomas Twining opened Britain’s first tea room here in 1706, Twinings tea is still a household name around the world. If you are passing through the Strand, “Take 10”, as the company slogan suggests, and drop into the Twinings shop. There is a new Sampling Counter where you can ask to try one of their teas, as well as buy some of the great selection of black teas and infusions in their beautiful cannisters or wooden boxes. Within the premises there is also a small museum with interesting old teapots and caddies and pictures of the Twining family. Although there are other Twinings stores at Westfield Shepherd’s Bush and Westfield Stratford City, the Strand store is a heritage shop and there’s nothing like buying tea from where it all started..